Melissa Rosenhan is a certified physician assistant at Schweiger Dermatology Group. Melissa graduated from Syracuse University with a degree in biochemistry. From there, she earned her Masters in Public Health from New York University, focusing on community and international healthcare, education, and healthcare management. Her passion has always been attributed to clinical medicine, namely dermatology. As such, she went on to receive her Masters degree in Physicians Assistant studies from Stony Brook University. She completed clerkships in psychology, obstetrics/ gynecology, general surgery, internal medicine, pediatrics, orthopedics, outpatient medicine, geriatrics, emergency medicine, and dermatology. In addition, she went on a medical mission to Honduras, where was given the opportunity to serve underprivileged communities from a public health and clinical medicine standpoint. During her two years at Stony Brook, Melissa served her class as the House of Delegate representative of the American Academy of Physician Assistants. 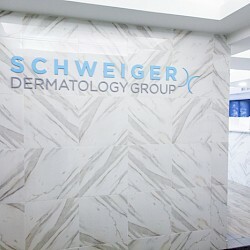 She completed a dermatology residency program at Schweiger Dermatology Group, where she trained alongside top dermatology clinicians in medical and cosmetic treatments and surgical interventions. Melissa is a member of the New York State Society of Physician Assistants, American Academy of Physician Assistants, and the Society of Dermatology Physician Assistants. As a clinician, Melissa takes pride in seeing patients of all ages for both medical and cosmetic treatments. She believes and practices medicine in accordance with the strong correlations between self-confidence, overall health, wellness and quality of life allowing for a holistic approach to her care. She focuses on a patient- centered approach, aiming to address each patient’s concerns by understanding his/her motivations and adequately educating each patient with each visit. Outside of the office, Melissa is an avid runner and enjoys spending time with family and friends. Graduated from Syracuse University with a Degree in Biochemistry.